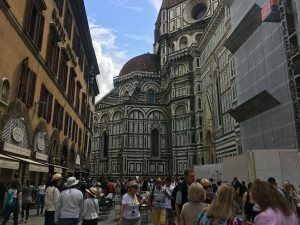 Florence is on many people’s ‘must do’ lists for Italy. It hadn’t made it to the top of our list on the way south, when we visited Pisa and Lucca, but when we were looking for somewhere to stop on the way to the Apuan Alps we decided it was worth a look. The reason that Florence hadn’t made it to the top of the list for us is that we aren’t great art lovers. Don’t get me wrong, a beautiful painting, a magnificent fresco, or an evocative sculpture is a joy to behold, but we’re not very good at appreciating art in bulk when the exhibits start to blend into one another. So, as you can imagine, we weren’t desperate to visit the Uffizi. 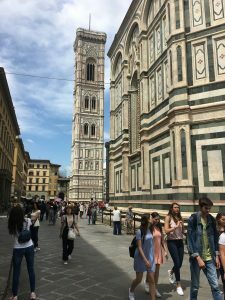 I really fancied climbing to the top of the duomo’s cupola, but you have to pre-book a time slot and when I looked the night before there were no spaces left. In the end we decided to plan a leisurely walking tour around the sights, including some ice-cream and lunch of course. 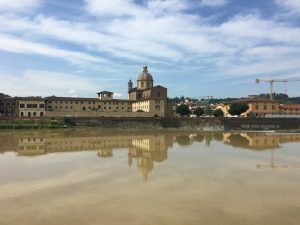 Our overnight parking in Florence was in the Scandicci district, a sosta that crammed motorhomes in as tightly as possible. Our sat nav took us on an odd route in ever decreasing circles through one-way systems to get there and we overshot the narrow entrance once. Once we were in it was well organised and plenty of information was available from the office (caravan) in the corner. For a suburb of a city the parking was remarkably quiet, the site is backed by farms so there is very little traffic noise, you might hear a whinny from the horses in the fields. One word of caution though – we arrived in late afternoon and the gates were open. The following morning we headed off at about 10 and the gates were locked – so if you are thinking of arriving in the AM be prepared. Someone will probably let you in. We walked in from the sosta, it is a good 45 minutes into Florence’s centre. The bus runs very regularly and is easy to catch from a stop up the road – save money by buying your tickets from the tobacconist rather than on the bus. 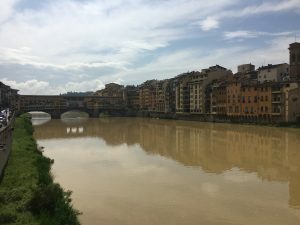 We wandered along the side of the very muddy Arno river up to the medieval Ponte Vecchio, the bridge is lined with jewellery shops on both sides so that in places you’d be hard put to recognise you were on a bridge – there is a lot of gold bling in once place. We marvelled at the highly decorated cathedral – one of the most impressive I have ever seen. We also marvelled at the queues stretching around the cathedral. It is free to enter the main building, but we decided not to wait in the queue. The Mercato Centrale was a good place to indulge our food loving selves, the ground floor was full of market traders selling meat, fish and vegetables as well as more exotic produce (I found some fish sauce which is a bonus for stir fries and thai food) and tourist merchandise. The upper floor had a selection of cafes and bars selling a wide range of drinks, meals and snacks. 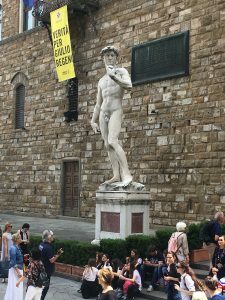 We admired a copy of Michelangelo’s David (there are two copies of the sculpture in the city as well as the original in one of the museums). For lunch we crossed the river and ate in a piazza in the Oltramo quarter which had a bit of a student/hipster vibe. We did, of course, eat gelato. It would be true to say that I enjoyed myself more than Paul, who was suffering in the heat. 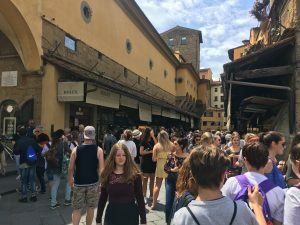 Florence was the busiest place we have been to since Rome and the sheer volume of tourists can be off-putting, but there are plenty of official staff on hand at the main tourist sights and strangely few touts. 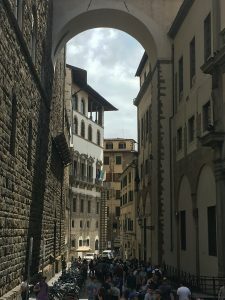 Our preference is definitely for somewhere a bit less overwhelming and we decided we had preferred the previous day’s trip to Arezzo.